The building in the center of the photograph is the Old Bailey, one of London’s courts, and the statue atop is The Lady of Justice. This iconic buildings including St Paul’s Cathedral, where this picture is taken, are a testament to the incredible work done by the London firemen in saving them. There’s a memorial outside St Paul’s dedicated to them. On December 29-30, 1940 the Germans deliberately targeted London with incendiary bombs during a period of low tide in the Thames, so the firemen had to work through deep mud all the night to get the water to save the city. What resulted was called The Second Great Fire of London. 29 bombs fell around the Cathedral, and one actually hit the dome, and fell through. During the Blitz, the Old Bailey was bombed and severely damaged, but subsequent reconstruction work restored most of it in the early 1950s. In 1952, the restored interior of the Grand Hall of the Central Criminal Court was once again open. The interior of the Great Hall (underneath the dome) is decorated with paintings commemorating the Blitz, as well as quasi-historical scenes of St Paul’s Cathedral with nobles outside. On 7 September 1940, the Luftwaffe unleashed a merciless bombing campaign against London and Britain’s major cities. Instead of breaking morale, however, the raids only galvanized the will of the British people for the rest of the war. With the exception of one night, when the weather was bad, the bombing continued for the next 76 nights consecutively, with daytime raids as well. Liverpool, Manchester, Swansea, Cardiff, Bristol, Southampton were also targeted. 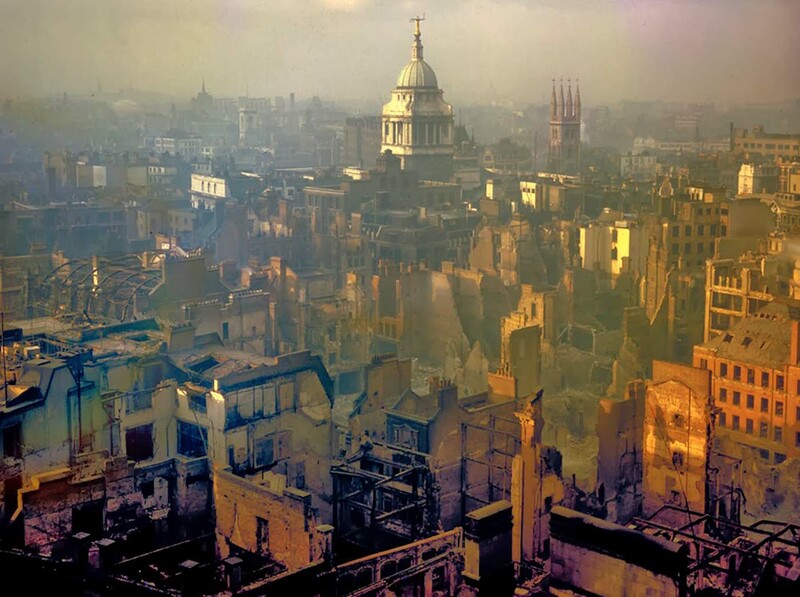 More than one million London houses were destroyed or damaged, and more than 40,000 civilians were killed, almost half of them in London. (Photo credit: Getty Image / Time). This site is addictive - so many interesting photos. I'm trying to extract myself to do other things. But I keep seeing another good page to open. The written explanations under the pictures also add a great deal of value for the viewer. What is the building to the right of the Old Bailey with the four spires on the roof? St. Sepulchre-without-Newgate, Holborn Viaduct, London, EC1A 2DQ. Compare this to the picture of Dresden earlier . . .